My friends and I seem to be trying harder to have a good time at Nur than Nur permits tonight. The puffy Kubaneh – sweet and eggy and hot from its baking mold – is the way to start. It comes with sweet grated tomato and torrid, green Yemenite schug alongside for dipping. Our foursome is instantly divided. The hot heads are charmed but our pal Catherine can’t take the heat. Kubaneh bread, warm from the oven, is served with fiery green schug and chopped tomato. And alas, the kitchen is out of sorts and out of octopus. I’d forgotten how relentless the clamor is. Our order seems to be taking forever. 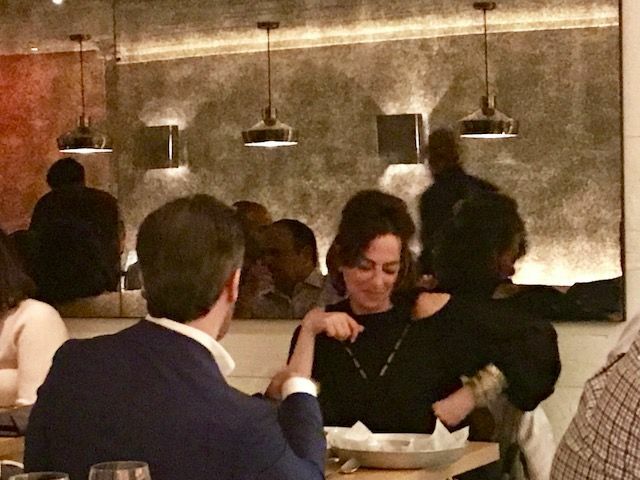 I see the quartet in the corner at the big marble table waiting too. Something seems wrong at Nur. The place is packed. That must mean someone loves it. Is everyone so busy flirting or checking their phones to notice the slights? 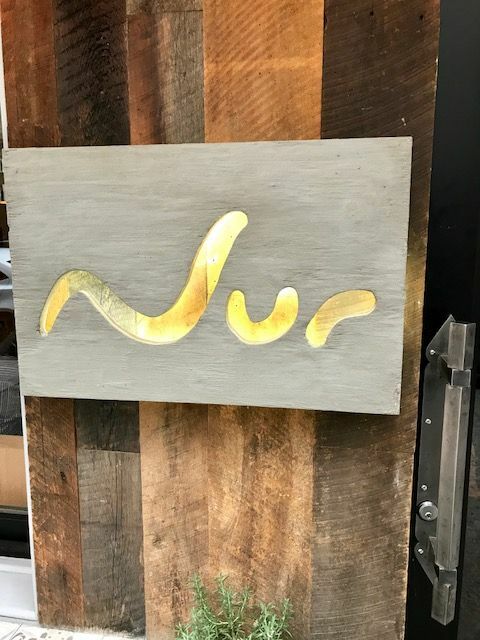 I was eager to explore the Pan-Middle Eastern creativity of Meir Adoni when Nur first opened in May. He’s a star in Tel Aviv. And his goulash of French technique, Moroccan heritage and a global pantry promised new tastes, the trip to Israel I’d always planned. Breads Bakery founder Gadi Peleg, a commuter from Israel, as partner would inject energy into the tight little 60-seat space. 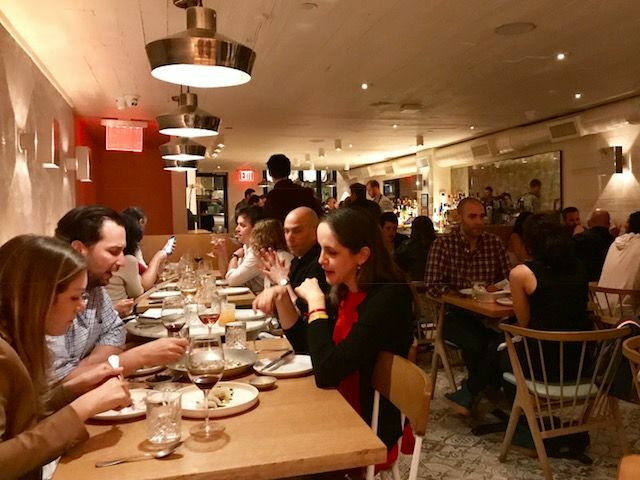 New Yorkers rush to reserve at the new Nur, curious too taste its Pan-Middle Eastern offerings. And it wasn’t just me drawn to the Mideast theme. Even before it opened, the place was fully booked. I had to call the publicist to get a table at a reasonable dining hour. So much for anonymity. 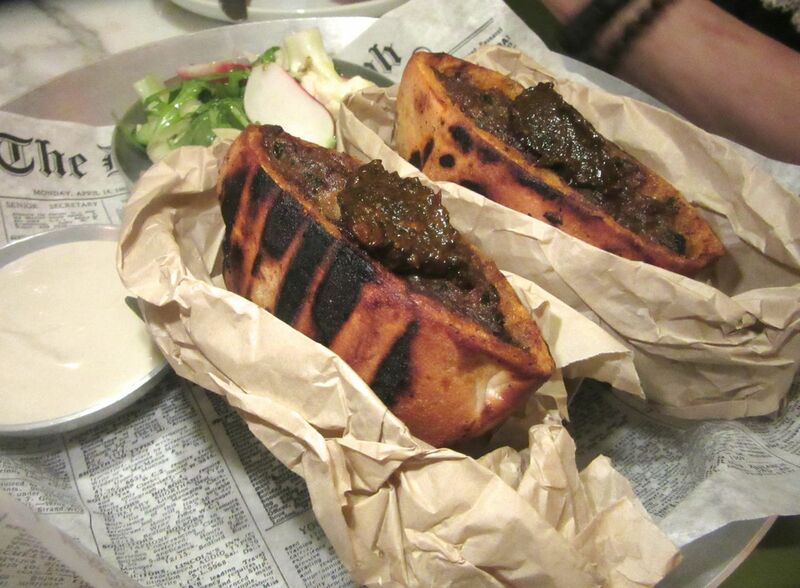 Order horias and you get grilled lamb kebab with eggplant and pine nuts stuffed into a pita. I was amazed to discover that gefilte shrimp in a jar tastes so much like gefilte fish. We tried the date doughnuts with smoked trout and almonds nested in a wooden box filled with black river stones. We shared a lamb kebab with eggplant and mango pickles stuffed into a pita and nibbled, without enthusiasm, at a jar of gefilte shrimp hidden under chopped dashi gelée to pile on toast. 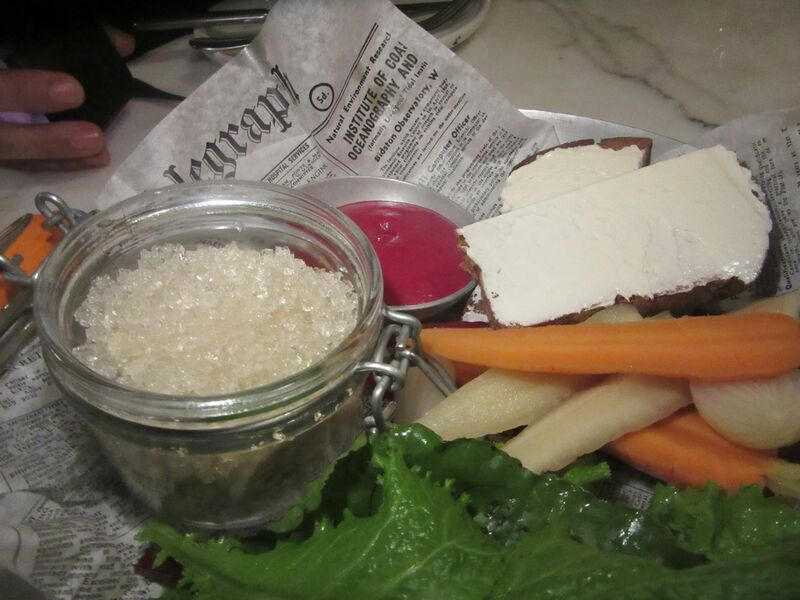 It was served with pickled vegetables and creamy chrain -- grated horseradish with beet juice. 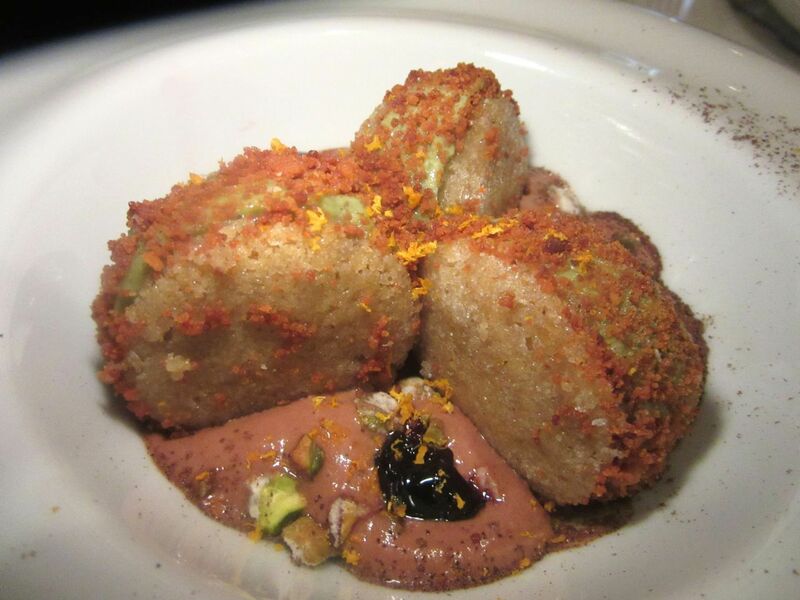 Smoked, chopped eggplant with dates, pistachio and rosewater sounded wondrously exotic. Exotic, yes, but not wonderful. 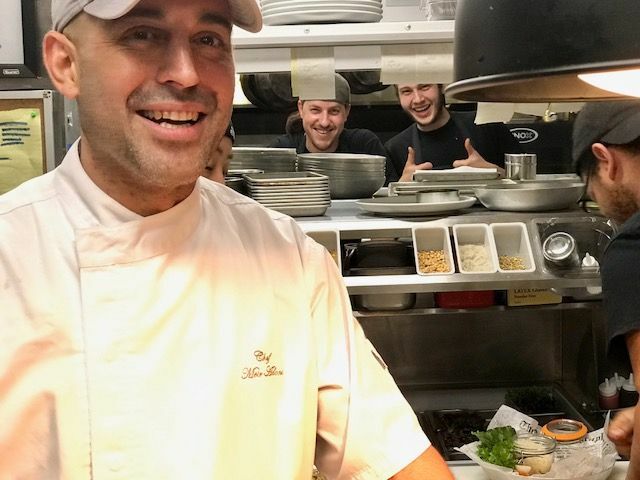 Dana Stoddard went backstage to capture the kitchen crew for this photo. At the end of the evening, after cassata with salted pistachio ice cream, I decided I would give the kitchen time and come back…eventually. But months went by and nothing about Nur beckoned. Occasionally a friend would suggest meeting there, but none could score a table. We’re not wild about smoked eggplant carpaccio with feta, raw tahini, dates, pistachios and rosewater. 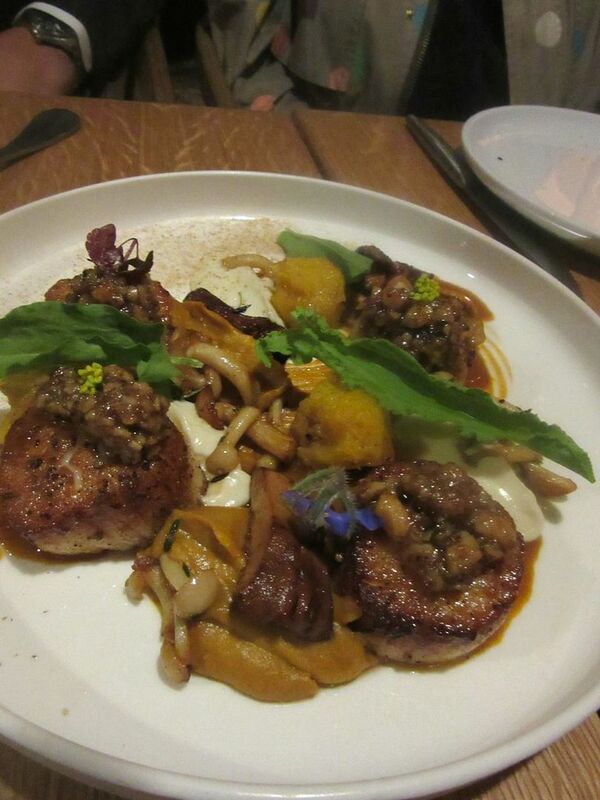 Then another professional foodie friend called the publicist, and that’s how we got in last week. Again, I have high hopes for dishes I’d never tasted before. The menu, once short and sweet, is even shorter now. Apparently New Yorkers failed to fall for calves’ brains fricassee on a butter croissant. The kitchen has abandoned the gefilte shrimp. 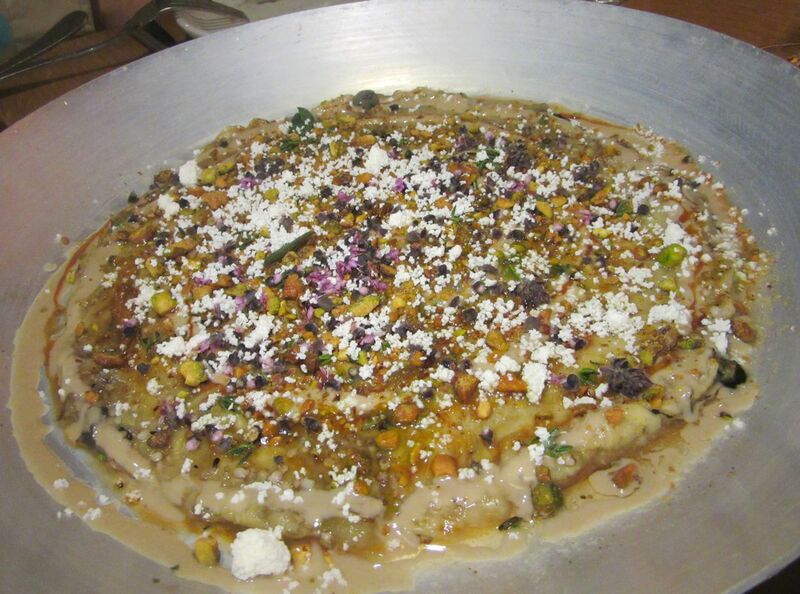 The Damascus qatayef, a crispy Syrian pancake filled with spiced lamb and herb yogurt, has been eighty-sixed too. And though still on the listing, the octopus is not available tonight, our waiter announces. 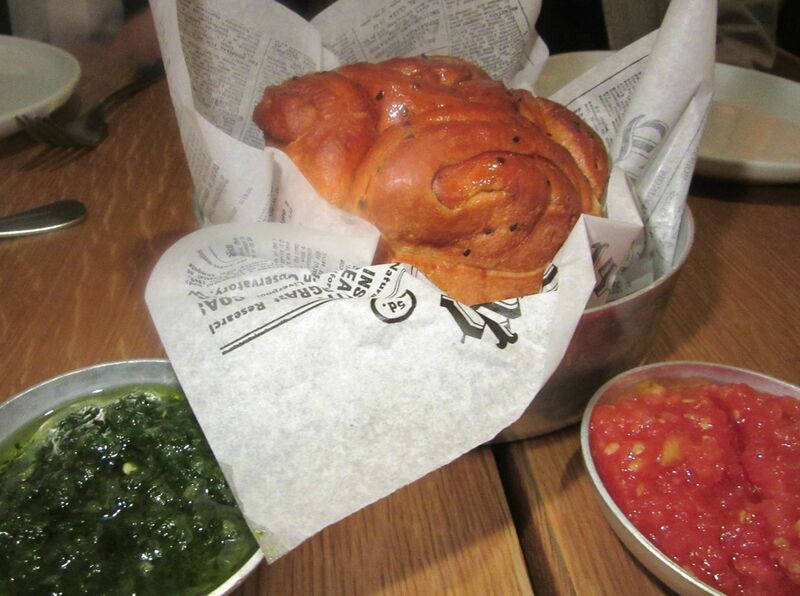 On that first outing, we did try the Jerusalem sesame bagel. A simit by any other name. Very good. Well, then, what will we eat? We decide to skip the sesame-crusted bagel – what they sell as simit in Turkey. “I can buy simit on 72nd Street,” I remind my friends, as once again we tear into the lush kubaneh, most of us savoring that green sauce. 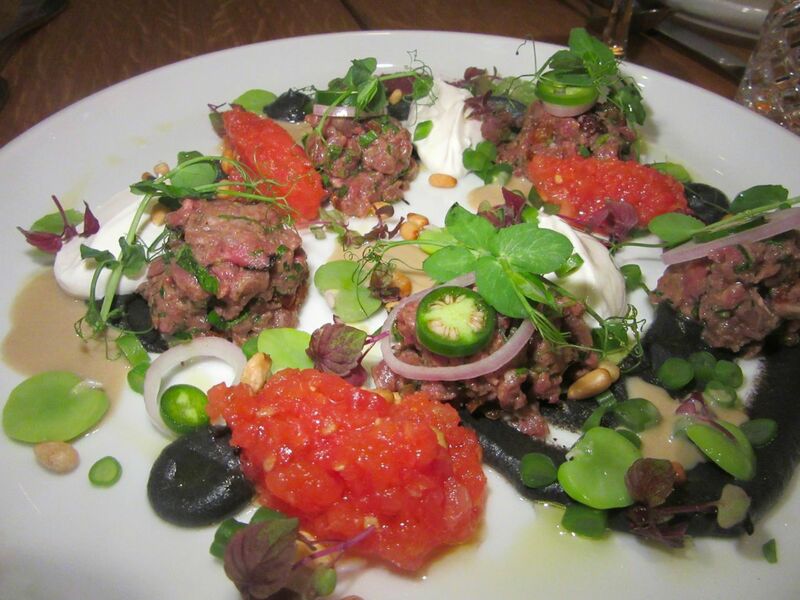 We quickly polish off savory Palestinian beef tartare with smoked eggplant cream and sheep’s yogurt. After an extended prologue of bread followed by nothing but good conversation, starters arrive. The excellent raw beef on smoked eggplant cream that we quickly devour. 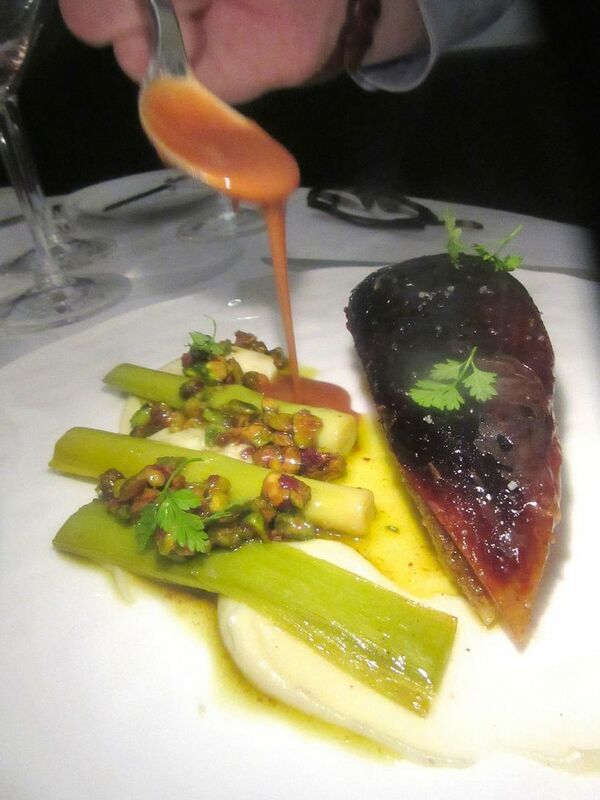 The minced smoked eggplant dish that I still don’t love. But I’m hungry. We order another kubaneh. The house sends out a second eggplant carpaccio, a gift. “We’ve already eaten that,” we tell the server. He smiles. He’s a charming guy. So is the host at the front who dashes up to see if we’re still suffering. 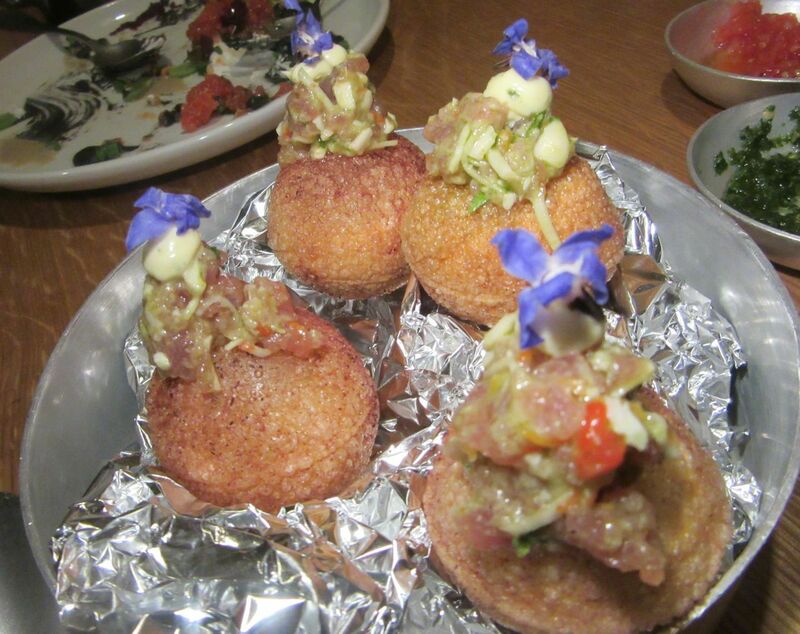 There’s just a dab of tuna ceviche atop these panipura pastries filled with yuzu buttermilk foam. 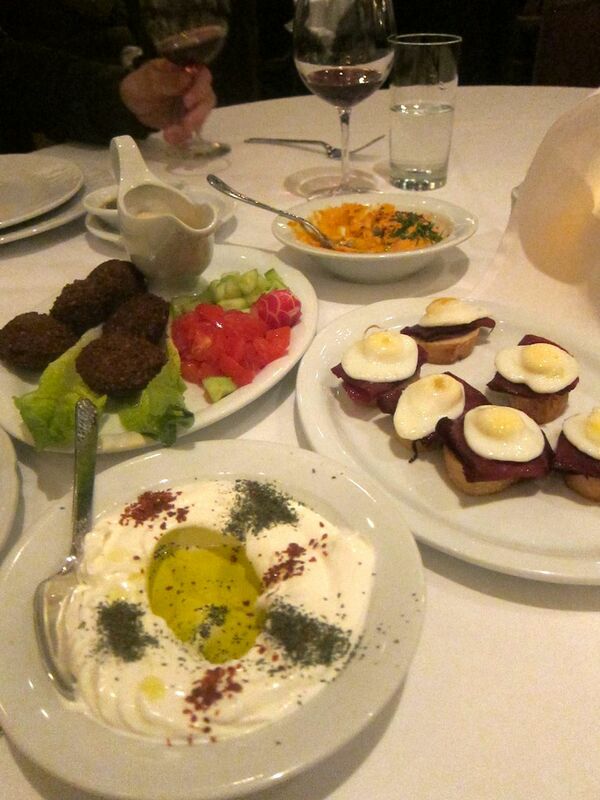 Waiting so long for main courses to arrive, we decide to order a second kubaneh. “May we ask how you like that?” we query two young women at the next table, sharing tuna ceviche pastries held upright in their dish by crumpled aluminum foil. I’ve forgotten that I’d rejected the same little yuzu buttermilk foam-filled pastries months earlier. It is taking even longer for our large dishes. “We did order, didn’t we?” I ask my mates. “Look around,” I suggest. “Does anyone else seem ready to scream?” It’s mostly a lively crowd. It’s true, but I find one man at a back table nodding as if already asleep. My companion takes a bite of the scallops she ordered and refuses to eat it because it’s sandy. We’re not flying tourist class either. Entrées are mostly $36 to $39. Turkish Delight on the Hudson – foie gras, pistachio tahini, smoked buttermilk honey cream, licorice sponge cake and poached quince – is $39. 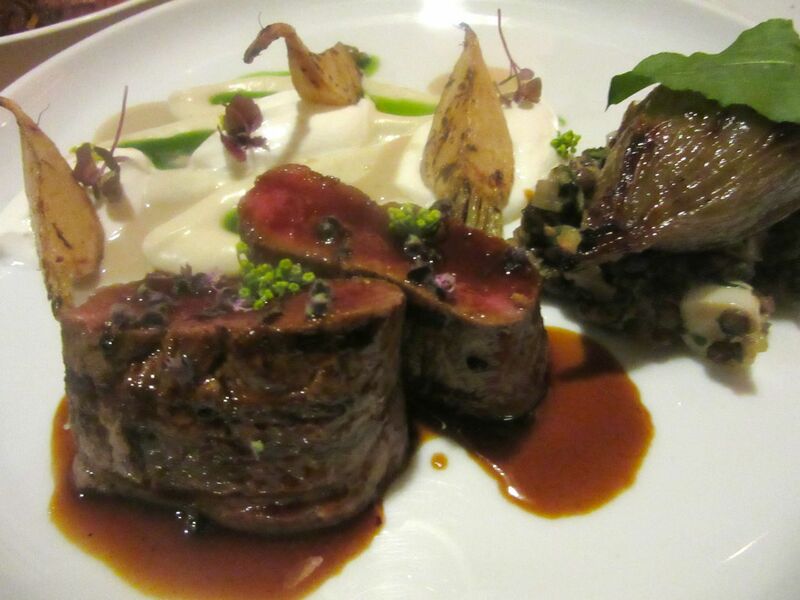 The grilled lamb tenderloin is meaty and delicious but an awfully small portion for $37. Finally. Signs of life in the kitchen. The seared scallops are sandy. The Baharat spiced lamb tenderloin is meaty and rare and really good. But for $37 I might expect more than two fat chunks on the plate. I finish off a third of my lamb tidbit and a chunk of bulgur stuffed onion no one else seems eager to try. 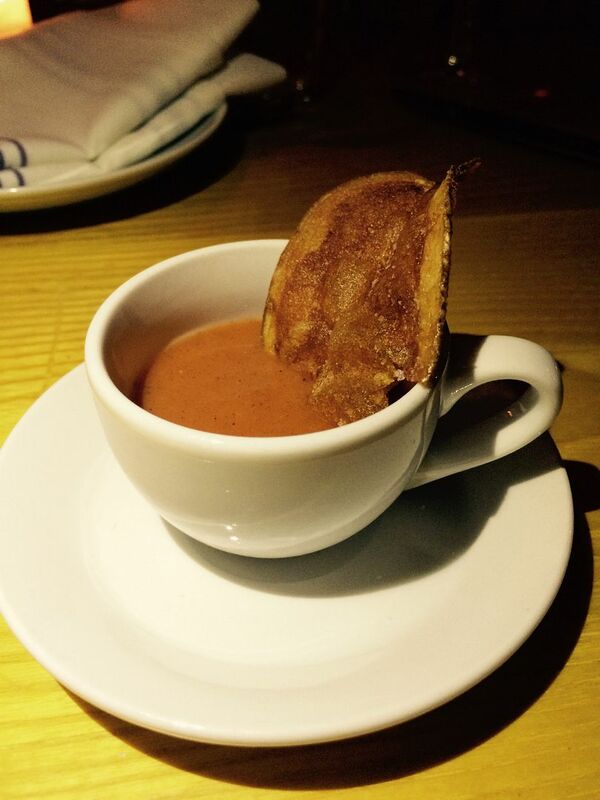 Maybe my complaint at Nur has to do with too much smoke, even this smoked chocolate custard. “We should have ordered the simit,” I muse. 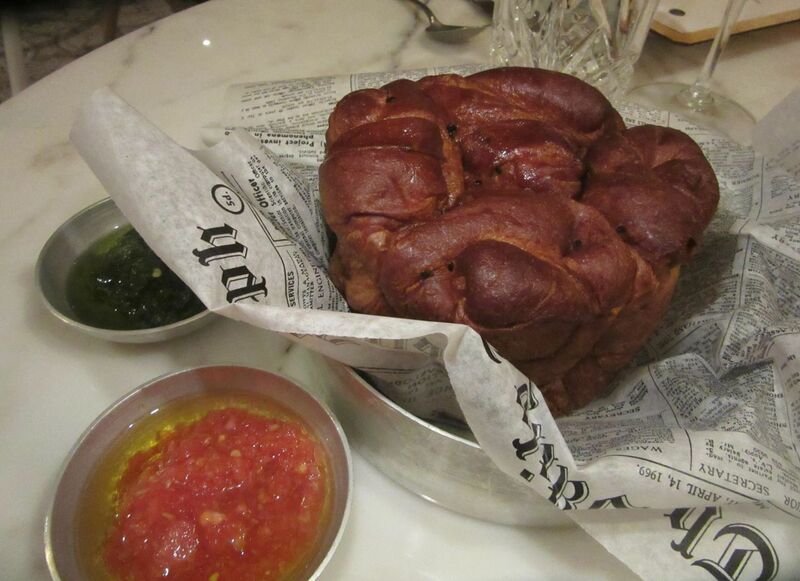 “And maybe the honey and garlic challah.” It’s unanimous that we will skip dessert. 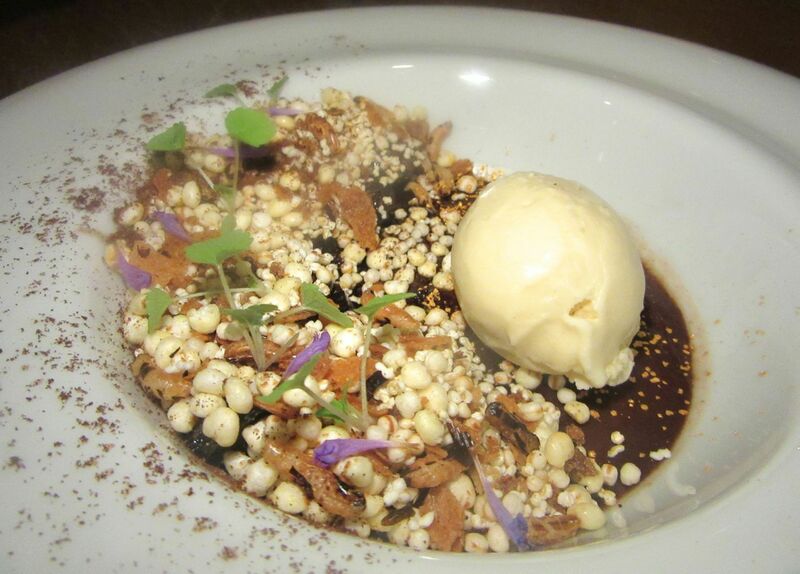 But then the house sends smoked chocolate custard with puffed grain granola. Even the check takes its time to arrive. Perhaps this is an unusual evening at Nur. I cannot say. 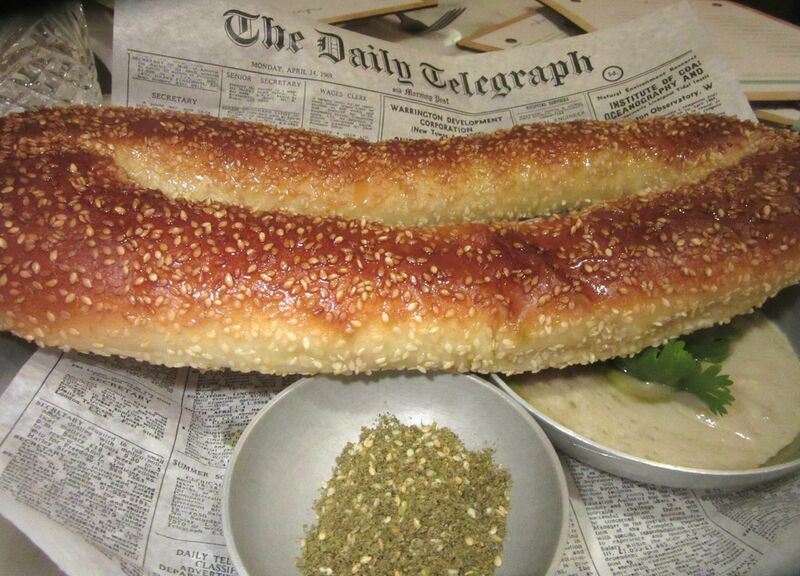 If only the shared passion for bread could unite the Middle East. At that first dinner the salted pistachio ice cream cassata with spiced chocolate foam goes mostly uneaten. 32 East 20th Street between Broadway and Park Avenue South. 212 505 3420. Sunday to Thursday 5 pm to 10 pm. Friday and Saturday 5 pm to 10:30 pm.